Exercise Jim, But Not As We Know It. The idea of Juneathon is to exercise every day, and I was doing really well until today. Today I was up and out at 8am to help build a music festival and there was no chance for a run, swim or bike ride, so I was facing disappointment. But as I sit here, aching, I can reflect on a day of tough workouts that have certainly taken their toll! The day started with weight training as I shifted picnic tables, staging, bars and festival art. Next was HIIT (High Intensity Interval Training) as I went at dirty flooring with a hose and hand brush, scrubbing furiously. A brief interlude while I plumbed in an outdoor shower. Then came the walking carry, 6 and 8 foot scaffolding poles, lots of them, walking around site with them in my hands, back and forth, again and again. Once they were all out it was back to HIIT with a squat, press, pull down combo using a post rammer to get the scaff in the ground. 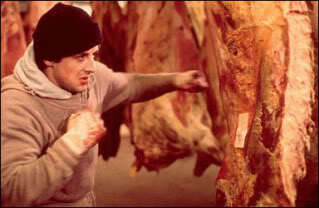 So, far from doing nothing, I’ve actually been in a day long training montage like something from a Rocky film. I even chased a chicken at one point! This entry was posted in Juneathon, Training and tagged fitness, Juneathon, training. Bookmark the permalink. 2 Responses to Exercise Jim, But Not As We Know It. Well it was certainly a workout!